Dancers at a Wednesday Night dance. Photo by Rachel Winslow. 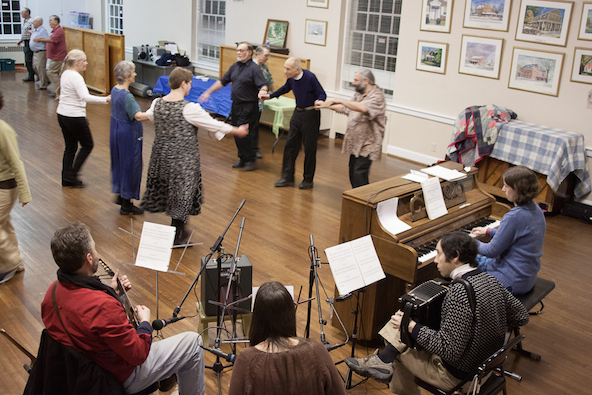 English Country Dancing is social, community dancing, where one of the pleasures is interacting with everyone in the room. New people are welcome any time, and you don't need to bring a partner. Afternoon $9, Evening $10, Both $16. GCD and CDSS Members: Afternoon $7, Evening $8, Both $12. Under 30: Afternoon $4, Evening $4, Both $8. (November – April) 2:00–3:30 pm – Old time fun for all ages. Dance to live music every evening!. No partners needed, friendly folk will ask you to dance. On Wednesdays and at Barn dances, each dance is taught. First Saturday events: Please wear flat-soled shoes. Saturday dance programs are more difficult than on most Wednesdays (especially the afternoon workshops). The programs are intended for dancers who know standard figures, such as casts and leads, siding, single and double figures of eight, and all manner of heys. Enjoy dances popular in 1650 through dances written in 2018—by turns elegant, rowdy, romantic, and playful—each with its own tune. Often the first thing that attracts people is the splendid live music.